The Ram 1500 4WD is newly redesigned for 2019. It features a lighter and stronger frame and higher towing and hauling capacities. Ram has also equipped their engine lineup with optional mild hybrid technology for better performance. The 2019 Ram 1500 4WD has also upgraded technological aspects of the vehicle with optional wireless device charging and a full suite of driver assistance technology. The 2019 Ram 1500 4WD can tow up to 12,750 lbs and haul up to 2,300 lbs. This makes the Ram one of the most capable half ton pickups available. It can also be equipped with trailer blind spot monitoring to help the driver tow safely. Now available in the 2019 Ram 1500 4WD is advanced driver technology. The upgrades include a 360 degree surround view camera, lane departure warning and correction, adaptive cruise control and parallel and perpendicular parking assistance. Also available is forward collision warning and automatic emergency braking. The Ram also comes with a standard backup camera. The 2019 Ram 1500 4WD comes standard with a five inch touchscreen. The upper trim levels also feature an 8.4 or massive 12 inch touchscreen. The touchscreen controls the Ram's Uconnect system which can also be upgraded to include navigation and Sirius XM with 360L. The upgraded system features advanced audio capabilities as well as smart phone pairing. The Ram 1500 also features Apple CarPlay and Android Auto. The 2019 Ram 1500 4WD comes with a standard 305 horsepower V6 and can be upgraded to a 5.7 liter Hemi V8 with 395 horsepower. Also available for both engines is the eTorque mild hybrid system. The eTorque option adds a battery powered, belt driven generator to improve performance and efficiency. The added hybrid system ups the gas mileage of the V8 from 15 miles per gallon in the city and 21 miles per gallon on the highway to 17 miles per gallon in the city and 22 miles per gallon on the highway. The eTorque V6 gets 19 miles per gallon in the city and 24 miles per gallon on the highway. One major advantage the Ram 1500 has over its rivals is interior quality. It features a spacious, comfortable cabin and high quality upgrades. The Ram 1500 can be equipped with a digital cluster display with 3D graphics and a 19 speaker Harmon Kardon sound system. It also offers buyers an optional oversized panoramic sunroof. The 2019 Ram 1500 4WD takes second row seating to a whole new level with class leading innovations to make the rear seats more enjoyable. The second row seating offers class leading leg room. The rear seats can also be upgraded to include a fold down center console and reclining capabilities. The two beds available for the Ram 1500 can be upgraded to include the RamBox cargo system. This feature is another Ram exclusive. The beds include two lockable storage bins to hold tools and equipment without affecting cargo capacity. The RamBoxes are drainable and feature LED lighting and a 115 volt power outlet. The Ram 1500 is known for having one of the smoothest rides in the full size pickup category. It rides nicely on bumpy roads and around corners. The Ram 1500 can also be upgraded to include an air suspension system. This feature is only available in a Ram and makes towing safer as well as lowering the vehicle's stance at highway speeds. The 2019 Ram 1500 4WD has plenty of luxurious add-ons at the upper trim levels. The Ram Laramie, for instance, comes with dual zone climate control, leather interior and a leather steering wheel. It also includes heated front and rear seats and ventilated front seats. The top trim level is the Ram Limited and comes with plenty of driver tech features as well as wireless device charging and premium leather upholstery. Off-road enthusiasts will want to check out the Ram's Rebel off-road package. It has been outfitted with an electronic locking rear differential and aggressive off-road tires. The interior is also more rugged with ruby red accents and tire tread inserts. While the 2019 Ram 1500 4WD is available in the crew cab and quad cab configurations, the regular cab configuration is not in production. 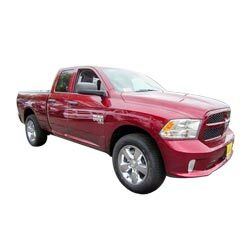 Many buyers will be let down by the lack of availability of a Ram 1500 with standard cab or eight foot bed. The 2019 Ram 1500 4WD is most capable when equipped with the 5.7 liter Hemi V8. Buyers will find that the estimated fuel economy of the V8 with or without the eTorque mild hybrid system is distorted by the fact that the V8 is designed to run only on mid grade gasoline. The available V6 and Hemi V8 are capable engines with adequate power for most applications. The absence of either a turbo diesel or turbocharged four cylinder may make a difference for some buyers when looking at all of the options. The 2019 Ram 1500 4WD has perennial competition in the full size pickup truck category. The main competitors are the Ford F-150 and the Chevrolet Silverado 1500. The Silverado is also newly redesigned for 2019. It does not have quite as much towing or hauling capacity as the Ram 1500. The Silverado does offer some unique towing technology, but the Dodge also has unique features like the RamBox storage system. Many buyers will find the interior quality of the Ram surpasses the Chevrolet, though the Chevrolet has some nifty luxury items like a heads up display and rear view mirror camera. The Ram probably edges the Chevrolet as the better truck, but it is a close call. Compared to the Ford F-150, the Ram has similar towing and hauling capabilities. The F-150 has more engine options and a more capable off road package in the Ford Raptor. The Dodge Ram outshines the F-150 with a more refined interior and smooth ride. Both trucks are capable and comfortable. The deciding factor for most buyers will be personal preference. Since the 2019 Ram 1500 4WD is all new for 2019 and offers very luxurious top trim levels, it could be considered as a competitor as an upscale full size truck. The GMC Sierra often takes the cake in the luxury field, however the Ram 1500 makes a bid for the title in 2019. Both are redesigned in 2019, and the GMC Sierra offers standard seven inch touchscreen and Apple CarPlay and Android Auto. The Dodge has overtaken the Sierra in interior quality offering a 12 inch touchscreen infotainment system and high quality interior. The Ram even delivers similar luxury to the top trim level Sierra Denali. The Ram 1500 makes an excellent truck choice for any buyer. It features some of the best towing and cargo capacity in the class. It also features many class exclusive features including the RamBox storage system, rear fold down center console and reclining rear seats. It also offer the eTorque mild hybrid system to enhance performance and fuel economy for both its engine options. The interior of the Ram 1500 may be the best one in the full size pickup truck category. It features plenty of head and leg room as well as standard touch screen. The upper trim levels include luxurious leather interior, two larger touch screens including the massive 12 inch touchscreen, and a very attractive panoramic sunroof. The upgrades are not limited to luxury. The 1500 offers an available air suspension system to make the ride smoother and safer. The Ram 1500 has also been updated to include lots of driver safety features. The Ram's 2019 redesign takes the classic truck into the modern day with plenty of thoughtful details. The Ram also has a new stronger and lighter frame to ensure the capability of the truck. In all, the Ram makes an excellent choice for anyone looking to buy a new full size pickup.